And I was hearing that their calls were like 99 percent to 1, you know. It was the local community bankers who were saying, “Please do this, because we’re next.” But otherwise it was very negative public response to this. And then, of course, we had some partisan petulance. I mean, it was sort of Washington at its worst. It was a really toxic mix. So, Jeanne, of a company called POLITICO, you say the fact that congress actually responded to the will of the people was “Washington at its worst!” This is exactly what is wrong with this country since its founding. The leaders in Washington, and their surrogates that are sent out to “analyze” for we the people, have disdain for popular opinion. Alexander Hamilton referred to the American people as “the great beast.” That is why the people were not allowed to vote for their Senator until 1913! And here we find ourselves in a very serious national problem, where a democracy should let the people decide our destiny. Yet the powers that be, and their surrogates like Jeanne Cummings, the Cato Institute, the Heritage Foundation, AEI, the Wall Street Journal, etc, etc must wrest power from the people for our own sake. Democracy is a form of government, capitalism is a form of economics. If we vote for socialism, or for the investment banks to pay for their crimes, or for anything, then so be it. That is the will of the people. All you who want to spread democracy around the world, that is how it works. 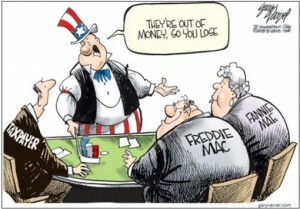 Lets start here at home, and the House rejecting this bailout was a great start. I watched the entire debate last night and rated it for freepress.net, then watched about 3 hours of post debate coverage on TV. NO ONE brought up McCain’s plan to create a “league of democracies.” He has brought this up as far back as May 2007, and brought it up again during last night’s debate. This is an extremely radical idea, and must be discussed. Would this plan include the democracy of Venezuela, which McCain and even Obama claim is a “rogue state?” And by the way, isn’t “rogue state” a reserved word for a nation that does not participate in the Non Proliferation Treaty? McCain’s “league of democracies” should bring up tons of questions…Who would it include and not include?…Do you care about it’s impact on the UN and how badly it would undermine the UN’s purpose?…Hamas was democratically elected, would Palestine be included? This idea is so radical and reckless it can’t be allowed to go on without question. I feel so-so about Obama on foreign policy, but compared to McCain Obama is a saint. Please, NBC, CBS, ABC, CNN, NPR, PBS, SOMEONE, investigate this and explain to the American voter what McCain’s plan is. Just a reminder to McCain and any “league of democracy” fan out there: the U.N. is there to prevent war and get countries who disagree with each other to engage peacefully in one place. Do you really think you can top that? Just admit it, this is about expanding your empire. Even our little blog has had 3 entries on the giant red alarms leading us up to this point, post 1, post 2, and post 3, dating back to early July. So ANYONE who says they had no way of seeing this coming is completely full of it. I repeat, this financial meltdown was expected. To stay a little ahead of the game, check out one of our recommended blogs by NYU professor Nouriel Roubini. He has been sounding the alarm on this since at least early 2007. Oh, and for those who say where was Congress to sound the alarm? the guy who wrote this article is Michael Hudson, Dennis Kucinich’s chief economic adviser. People have been sounding the alarm, it’s just that the national media has completely dropped the ball, (think WMD). They are only interested in one thing: profit, and therefore ratings, NOT NEWS. Speaking of not in the news, the proposed defense budget for 2009 is over $600 billion. That is more than the defense budget of all other nations combined! You’ll have to learn about this from the Asia Times. If you don’t believe them, check it out on the white house website. We the people have got to stop reckless privatization and an insane war budget, let’s start now! He has said he thinks that you are rich only if you make more than $5 million per year. And if that’s not enough, he doesn’t know how many houses he owns. Note that McCain’s son was on the board of this bank and was a member of their accounting committee until 1 month ago. 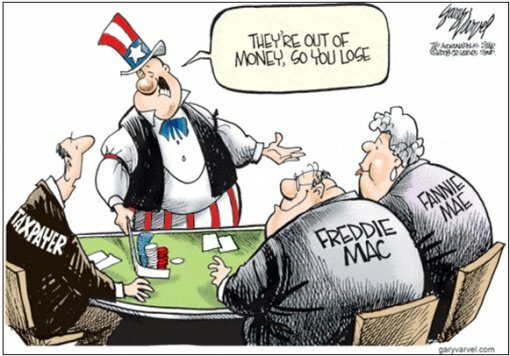 And perhaps more significantly, it appears Fannie Mae and Freddie Mac are going to be taken over by we the people by Monday…all $5 trillion in loans they have outstanding.